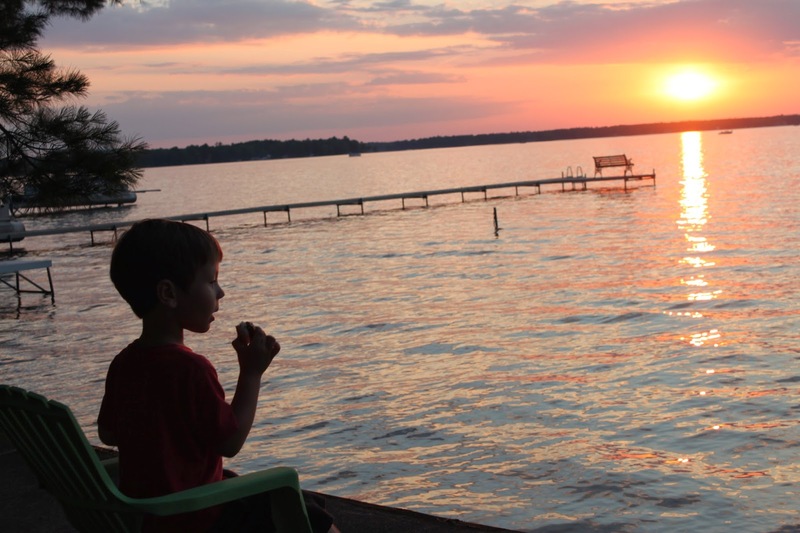 Looking back on my childhood, there are a handful of memories that stand out among the rest, the vacations we took and our family traditions. Every Halloween we had dinner together and my family took part in the Halloween party I arranged before we headed out to trick or treat. 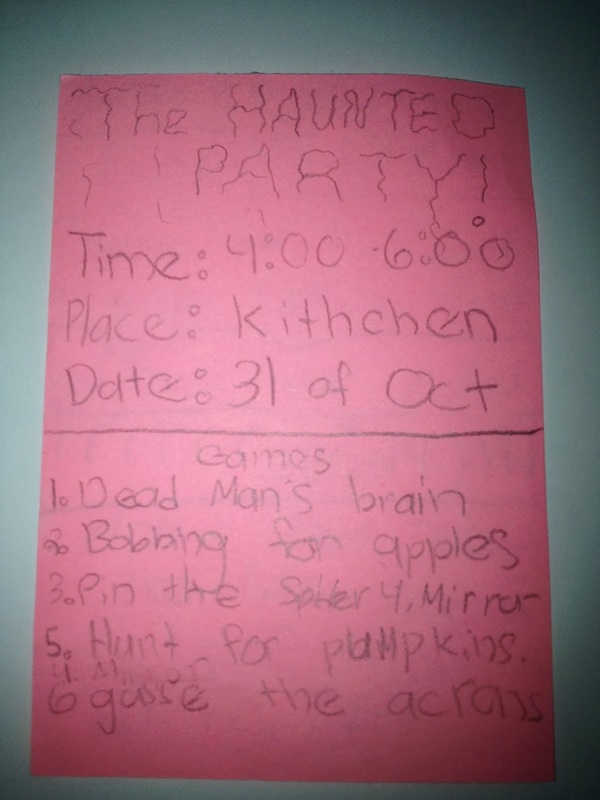 My dad always took my sisters and I out while my mom stayed inside to hand out candy. And no wimps allowed, when it came to trick or treating we wanted to cover the entire neighborhood and no cold weather or rain would stop us. Once we were satisfied with pumpkin buckets bursting, we hurried home to spread out our goodies on the floor while categorizing and trading with each other. Christmas Eve was another favorite, we were allowed to open one present, attended Christmas Eve Mass, enjoyed a candle light breakfast and a reading of Twas the Night Before Christmas before my sisters and I excitedly gathered in the same room for our "sleepover!" To this day, I actually prefer Christmas Eve with all the excitement and anticipation over Christmas Day. Of course who can forget a family vacation to Disney World?! I remember my mom planning this trip for months and it was every bit as magical as I had hoped it would be. 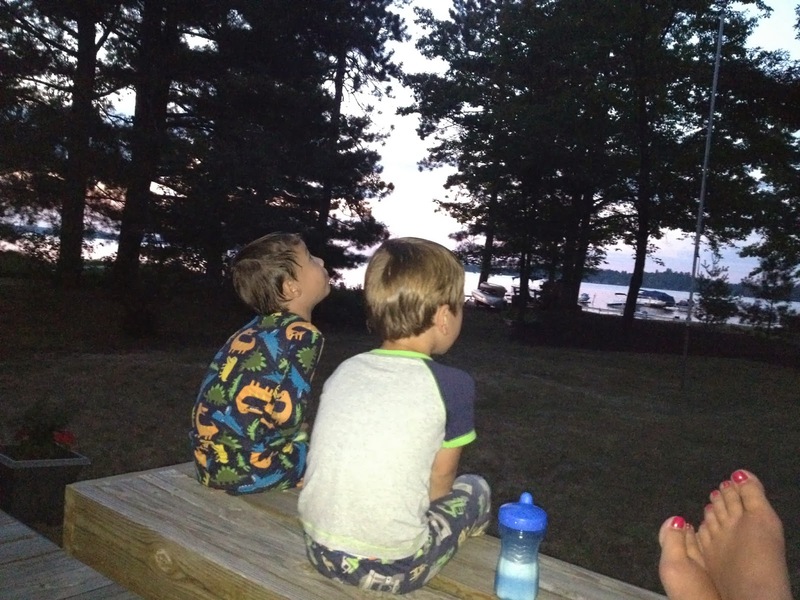 My husband and I took our boys last year for their first time while the girls got to spend some quality time with grandma and grandpa (we are planning another trip back when the girls are older). It has been six months now and the boys are still talking about it. Plus, it was great to give them our undivided attention again since they have been so patient and loving towards their little sisters. 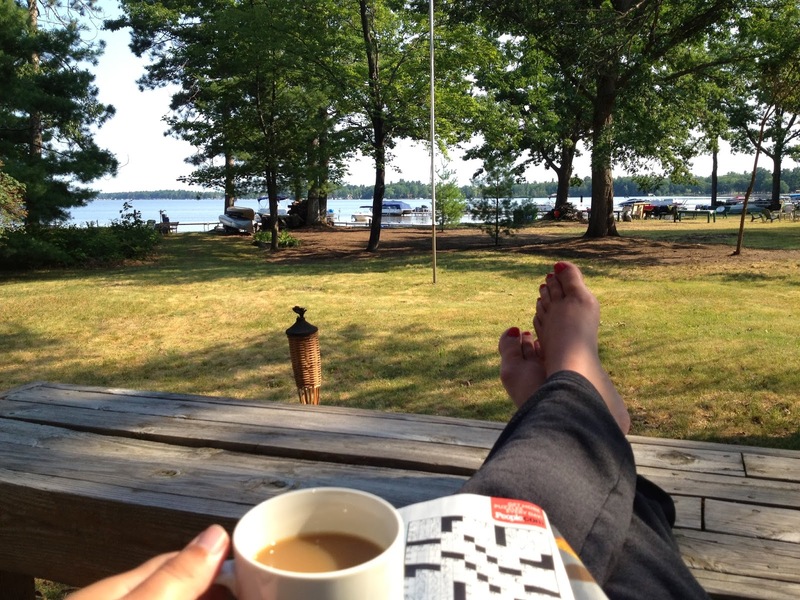 Another vacation tradition was our week long cottage vacation on Lake Michigan. I remember these vacations like they were yesterday, always the second week in July, playing in the white sand all day, swimming in the warm water, the 100 year old Victorian cottage with a wrap around porch, drifting off to sleep listening to the waves crashing on the shore, picking out candy at the nearby general store, and spending time with our extended family. It was an event we all looked forward to every year and still talk about to this day. Now that I have my own family, we have started many of our own traditions. Visiting the pumpkin patch for a hayride to pick out pumpkins, filling the kids' rooms with balloons on their birthdays, visiting the tree farm to pick out the tallest Fraser Fir our home can hold for Christmas, and our after dinner walks and water balloon fights during the summer. 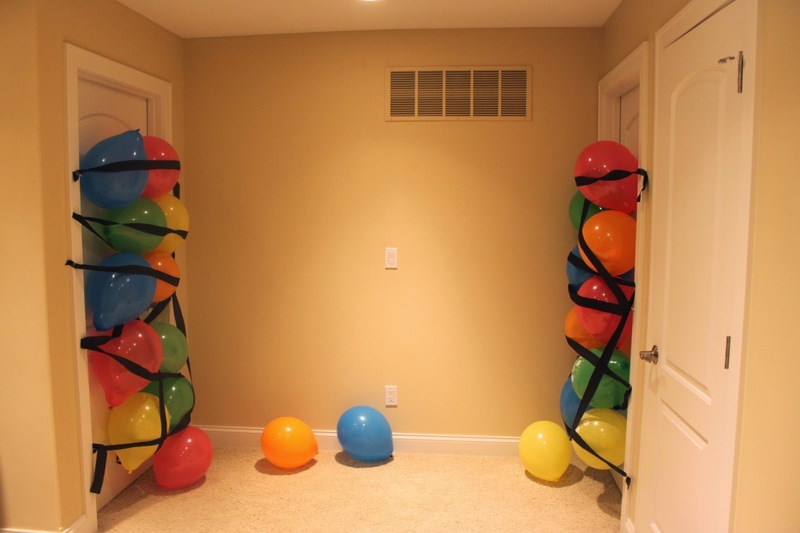 This past year we mixed it up and did this instead of filling their room with balloons while they slept. They LOVED it! I have also carried over many of my old family traditions. 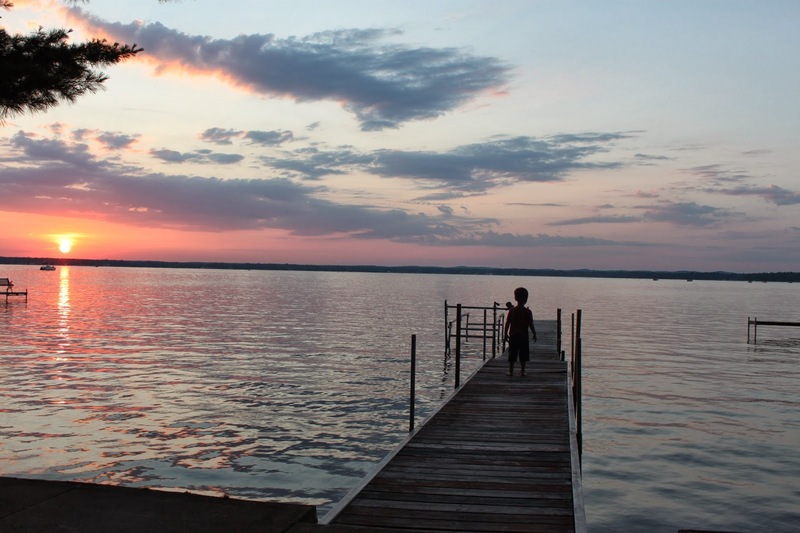 One of the those is our week stay at a cottage on one of Michigan's many beautiful lakes during the summer. 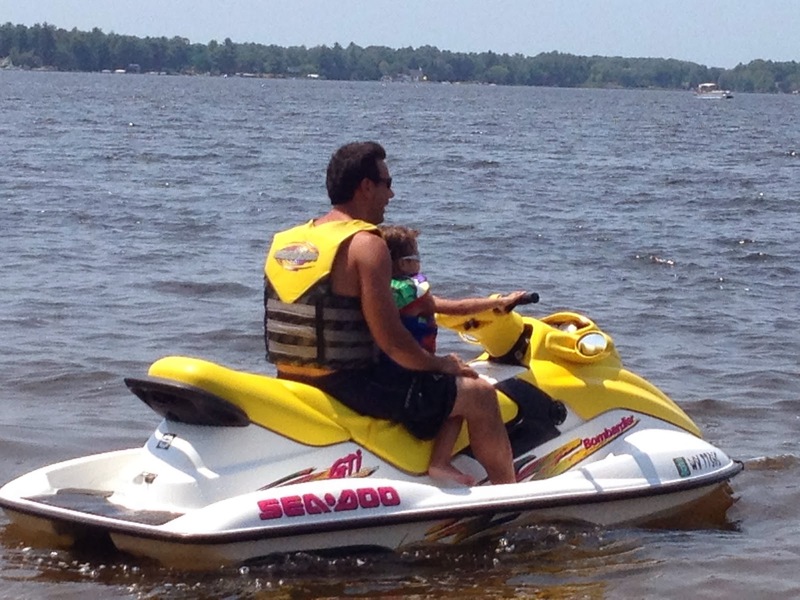 We started doing this when the boys where just 7 months old and have been fortunate enough to do this almost every year since. 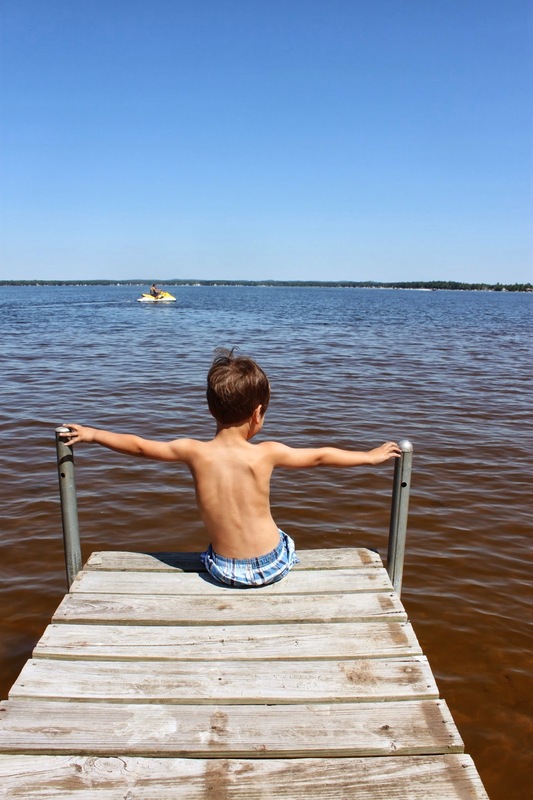 This particular year, I was pregnant with the girls and spent a relaxing week over the Fourth of July floating in the water and spending fun filled days with "my boys,"our family and friends. Sisters having a blast on the water! 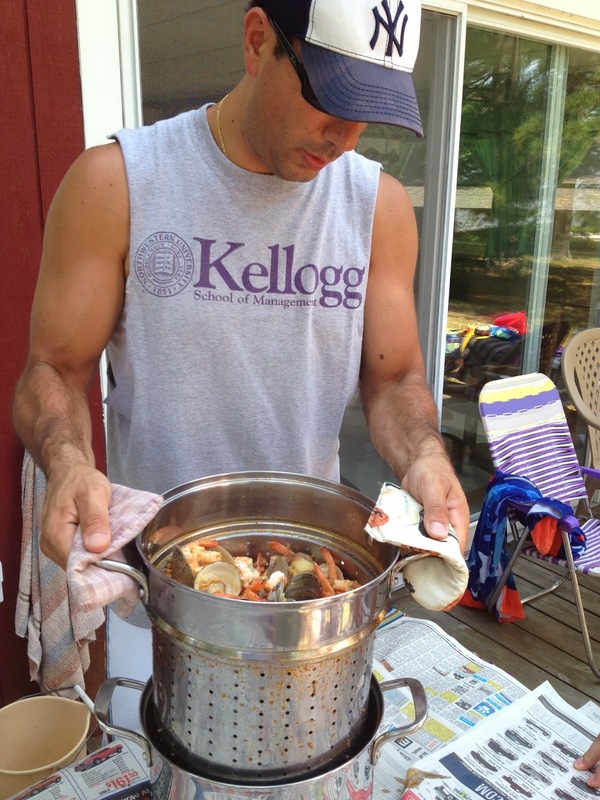 I made a shrimp boil for the boys' Under the Sea party when they turned two and was excited to try it again with a couple adjustments. 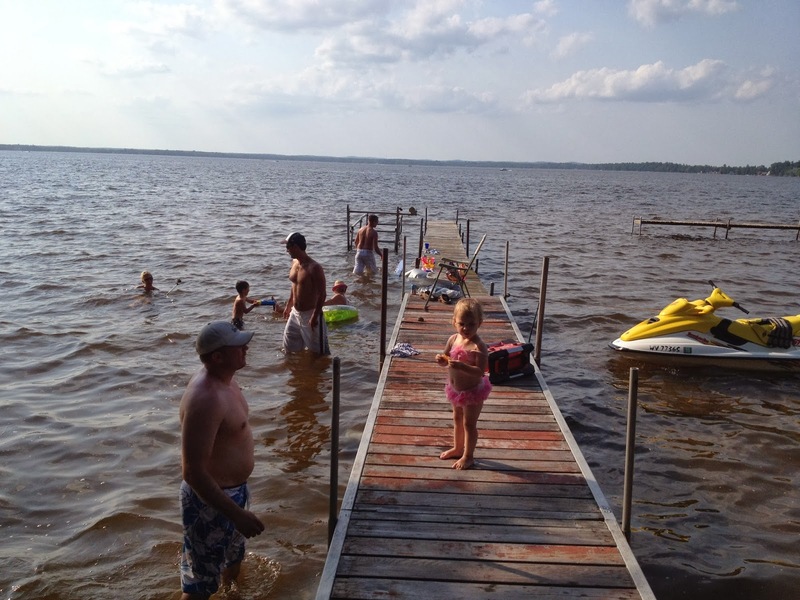 Fourth of July on the lake with our family was the perfect opportunity. 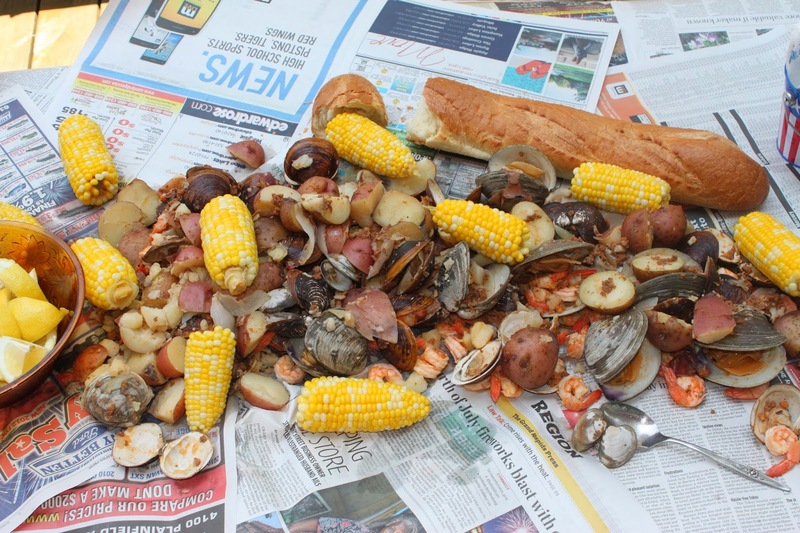 Shrimp, clams, red potatoes, onion, corn on the cob, and sausage all boiled with a little Old Bay seasoning and garlic. Simply drain the liquid (strong muscles required, as this is heavy :) and serve with lemons, hot sauce, cocktail sauce, butter, and bread. So while the latest Lego set or Barbie mansion might be highly desired by our children, it's the family traditions and time spent together that we remember forever. Do you have any family traditions you would like to share? Please feel free to leave me a comment. Prior to the birth of my second set of twins, I worked part-time as a school social worker. It was a job that I absolutely loved but it certainly came with a fair amount of stress due to the nature of the profession. 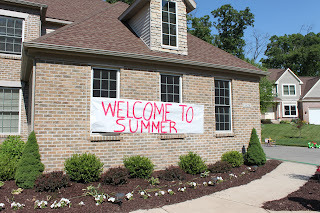 Every year when June arrived, I got just as excited for summer as the kids and teachers did. No early morning alarm going off, long, hot days at the beach, sunshine, grilling, fresh fruit, I could go on and on. 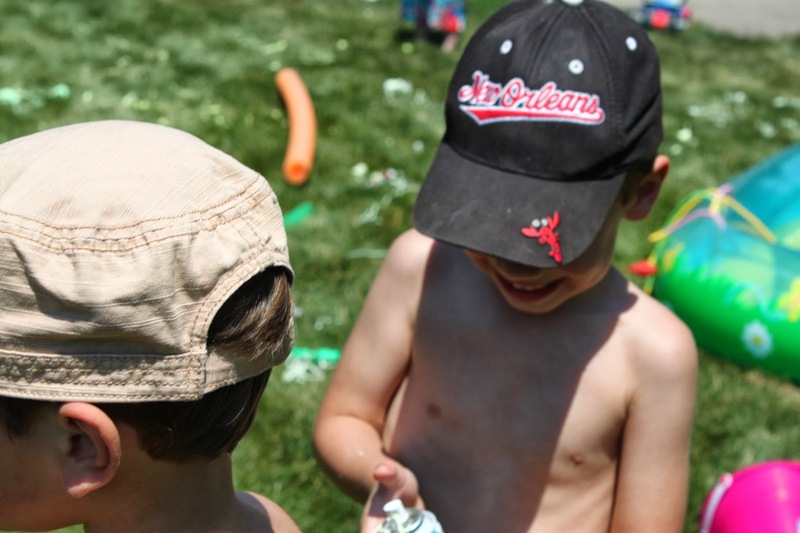 With all this excitement came an idea to host a "welcome to summer party" that included bubbles, inflatable pools, slip n slides, water balloons, silly string, sprinklers, sunshine, and a group of very excited kids, mommas, and even a daddy! The guests included my wonderful friends from work and a Friday play group at church. They all have children the same age as mine. One of these amazing women was pregnant and in the hospital so her brave husband brought their daughter to this party as the only man among all the other moms and kids. 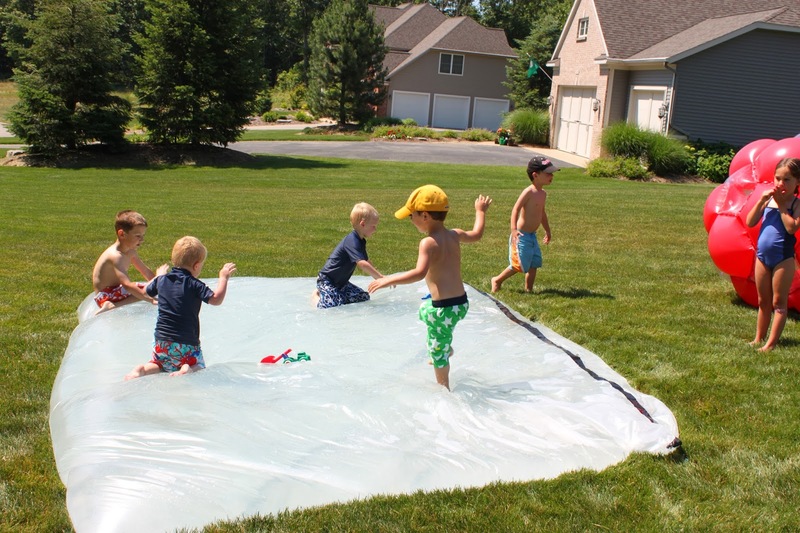 That year our last day of school was on a Thursday, this party took place the following day, on a hot, sunshine filled morning! With this age group of children, naps are a must so I invited everyone over around 11am to play, eat lunch, and then head home. The boys and their cousin checking everything out before their friends arrive. 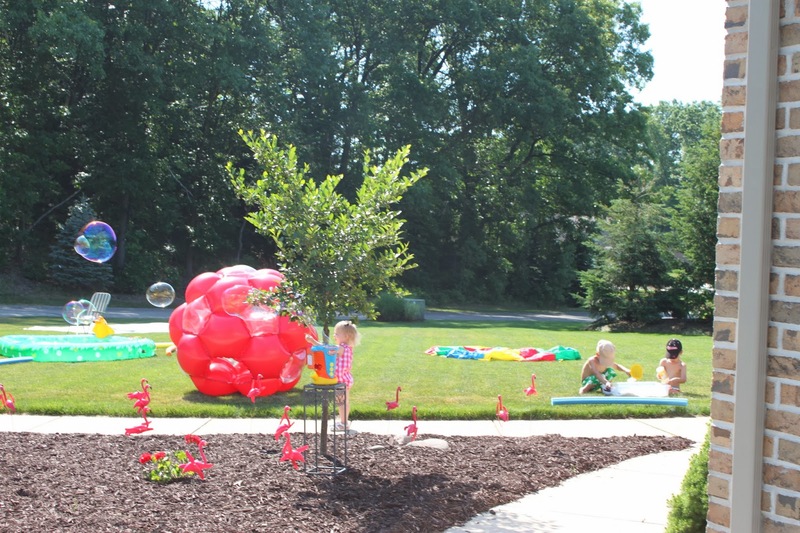 The pick flamingos are from Oriental Trading and always a colorful addition to an outdoor party. The bubble machine was also going and creating large bubbles all over the yard. 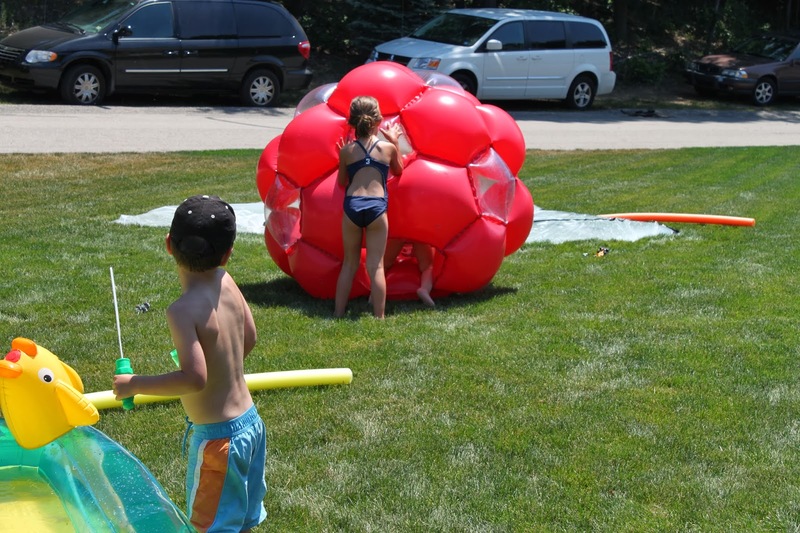 When I began planning this, the first thing I wanted to make was the water blob I first saw on mommiesmademedoit.com. The materials consisted of a large, clear painter's tarp, duct tape, and a hose. It looked easy to make and lots of fun. Although when I began filling it that morning it did have a handful of small holes which I was able to cover in more duct tape. I was five months pregnant at the time, so sitting in the bug filled grass assembling this a couple nights prior was a little daunting. I also learned that when doing this, it needs to be on a completely flat section of the grass. In the end, it was functional and I think the pictures speak for themselves. I had a couple of planned activities, but most of this was set up for free play so the parents could kick back and relax while watching the kids play! 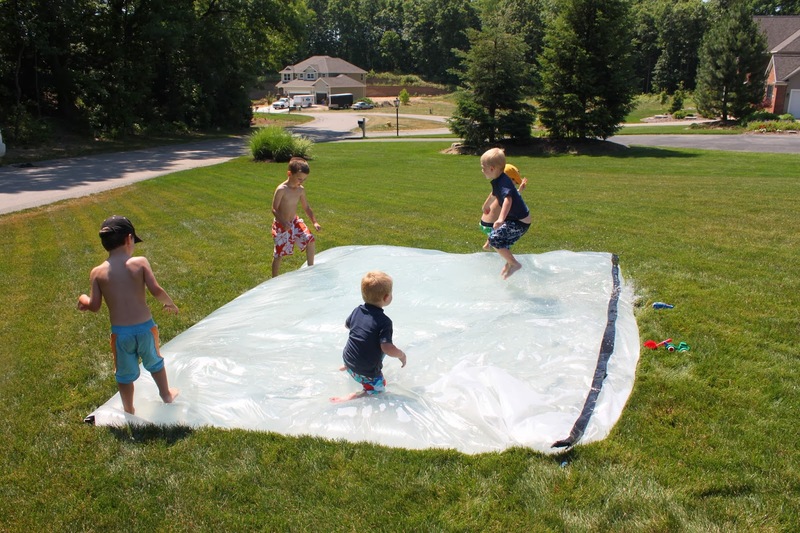 I had the Little Tykes bounce house up and running, two inflatable pools, a water table, home made side walk paint (equal parts corn starch, water, and a couple drops of food coloring), chalk, a slip n slide, the big red ball, a bug dig, bubble wands, and various pool noodles, balls, and outdoor ride on toys available. Much of the yard is under the bright noon sun at this time, so I added a beach umbrella and a couple of blankets for a little shade. I found the inflatable ball at Costco. You can climb inside and roll around. 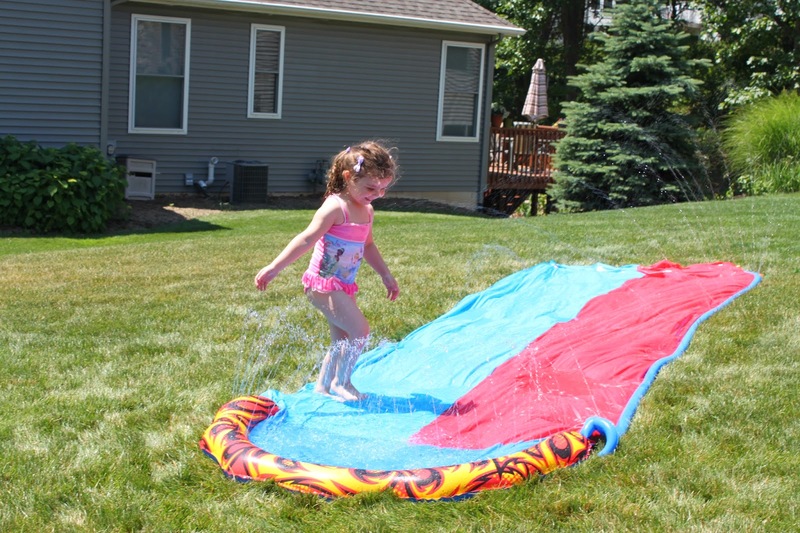 It's always been a favorite summer time toy! I brought our rice bin outside, added a pack of plastic bugs from Dollar Tree, and a few plastic shovels for some clean bug digging. After the kids all played great together and the parents relaxed for hour or so it was lunchtime. Everyone generously offered to bring something which I happily accepted. We had a rainbow display of fresh fruit, kid's yogurt, pasta salad, veggies and chips. I grilled hot dogs for the kids that morning and kept them in the warmer until it was time to eat. I also made sandwiches for the adults and had a cooler of water and juice boxes. Our friends also brought cookies and popsicles for dessert. 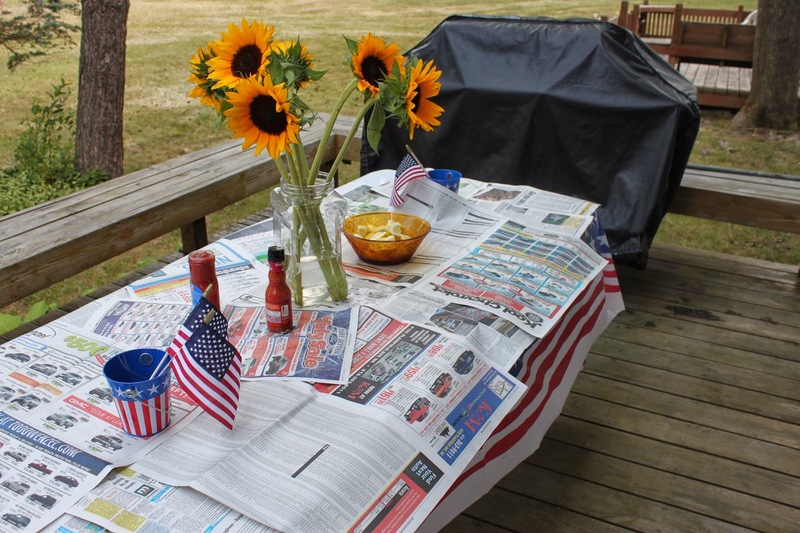 The food table was covered in a dark blue table cloth and sprinkled with brightly colored summer time confetti. For the kids' meals, I used our red food baskets lined with red and white checkered paper and red plastic utensils. After everyone ate, it was time for a little more fun before they left. 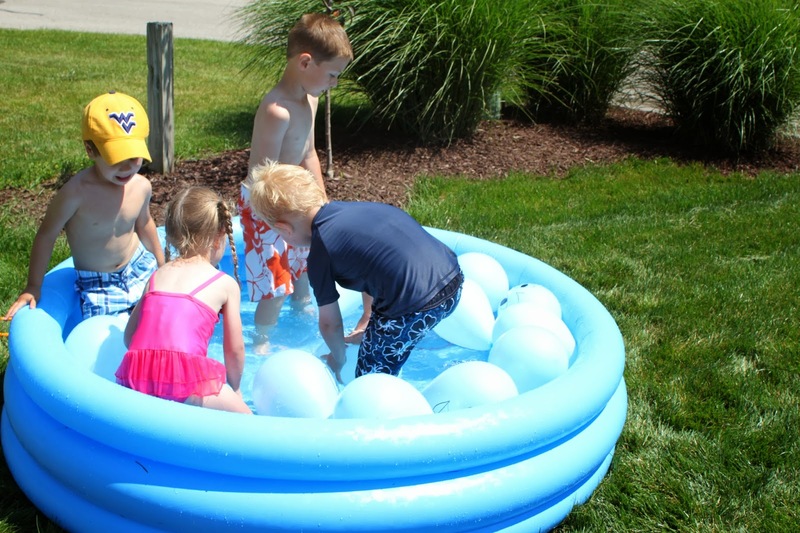 I had blown up blue balloons and drew a shark face on them which I put in one of the pools and had the kids do what they could to pop the balloons. This kept them busy for a little while. The parents joined in and we used our large play parachute for a water balloon toss. 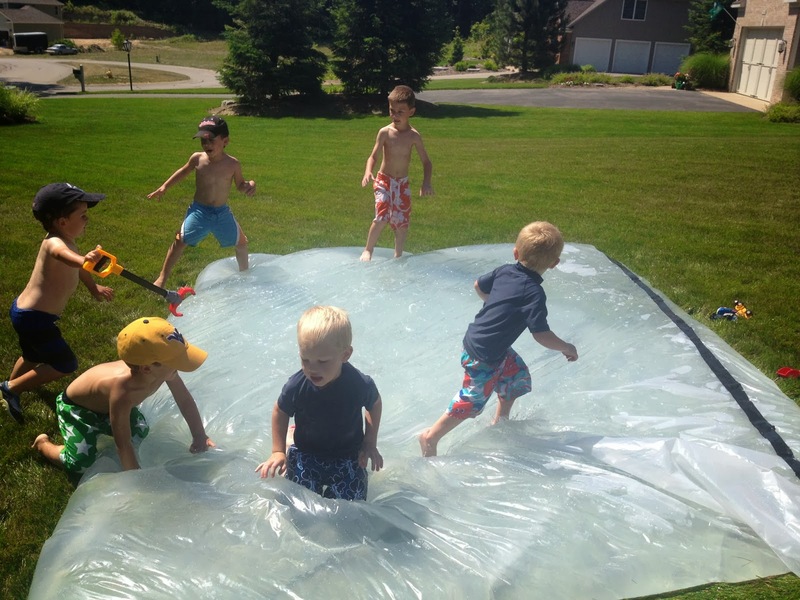 Although, this didn't keep the kids' attention for long so we ended up having an old fashioned water balloon fight! I called the kids over then and handed each of them a can of silly string from the dollar store and told them to go after their parents. It was hard for little fingers to spray these so the parents happily joined in to help out. After every last can of silly string was sprayed and water balloon tossed it was time for a nap and sweet dreams of the summer ahead! 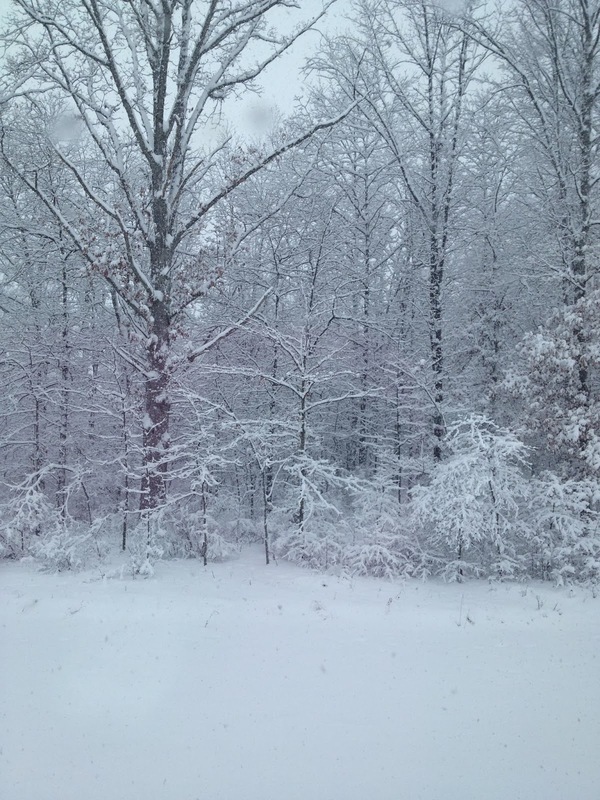 The first snowfall, it's magical for kids and adults. Kids can't wait to dig out their snow pants and rush out the door to flop on their backs and make the season's first snow angel, even if there is only an inch of snow on the ground! The anticipation and excitement of the upcoming holiday season is upon us and freshly fallen snow glistening on the tree branches is just beautiful. This year we had much more than one inch of snow! And then January comes. The excitement of the holidays are over, it's cold, it's dark, and this year, well a good portion of the country has experienced record snowfall and cold temperatures. I personally spent a majority of January stuck in the house with my kids, all day, everyday. I lost track of the unusual amount of days off from school this year. 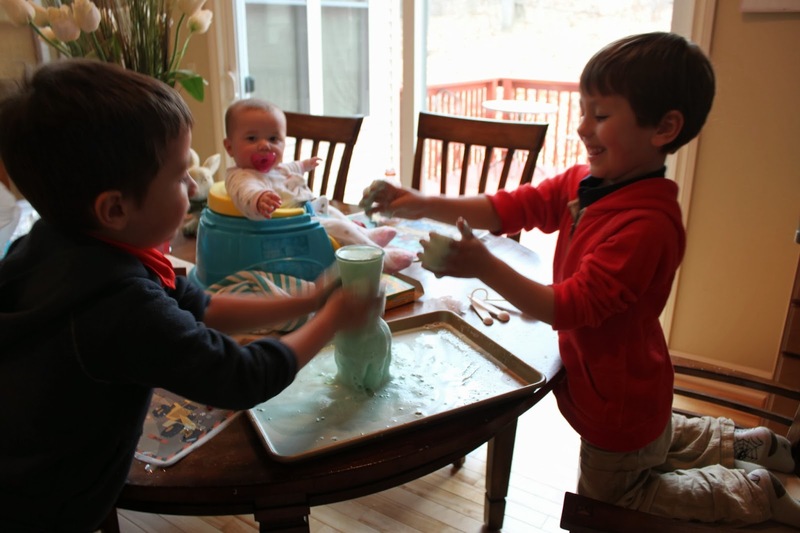 The first couple of snow days were cozy and fun filled with indoor and outdoor activities. Then the temperatures dropped to below zero and the cabin fever started setting in. I could feel my blood pressure rising significantly over the smallest things. That's when I knew it was time to get creative and pull out some of our "tried and true" favorite winter activities and test out some new ones too. It doesn't matter if it's homemade soft pretzels or brownies out of a box, kids love to help cook. Not to mention great skills for them to acquire. 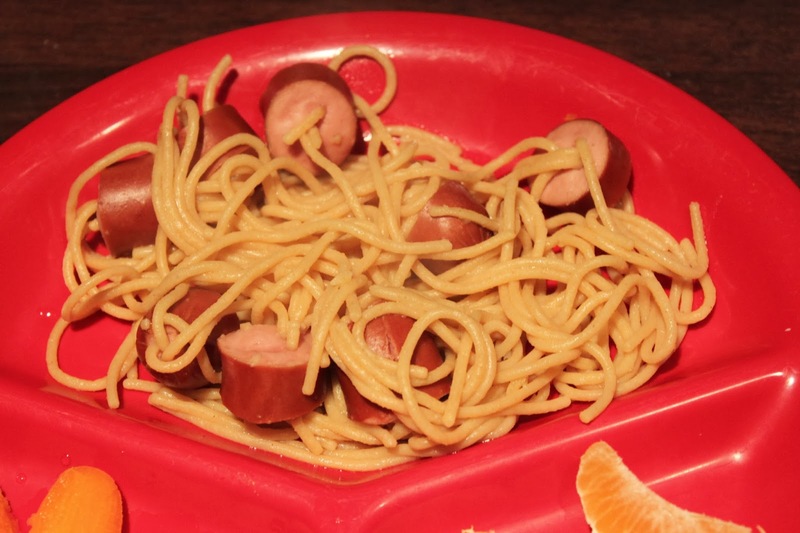 One of our easy and fun meals to make is turkey hot dogs and spaghetti. You can use any type of hot dog, but I like to get the Oscar Meyer Naturals Turkey dogs. 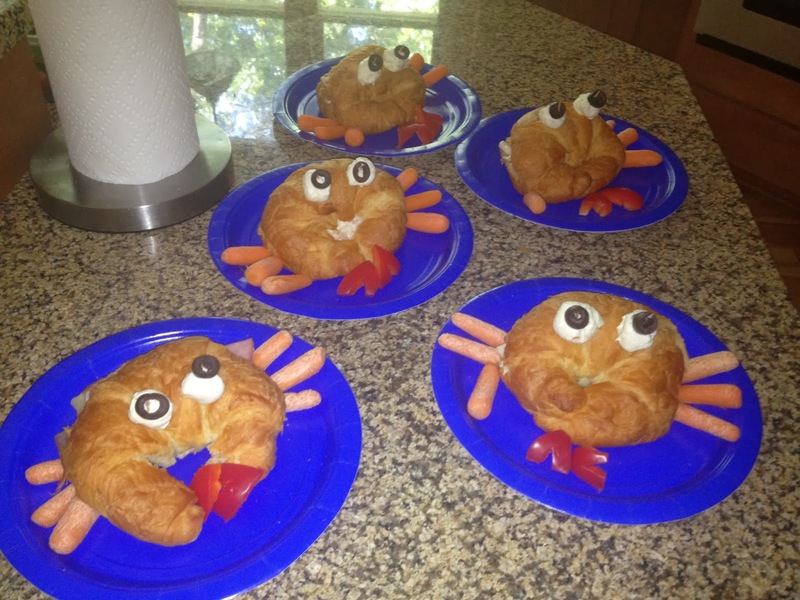 I cut them up into bite size bits then let the boys push about six strands of uncooked spaghetti through the middle of the hot dog. Boil until spaghetti is cooked, about ten minutes and enjoy. My kids always eat these up. 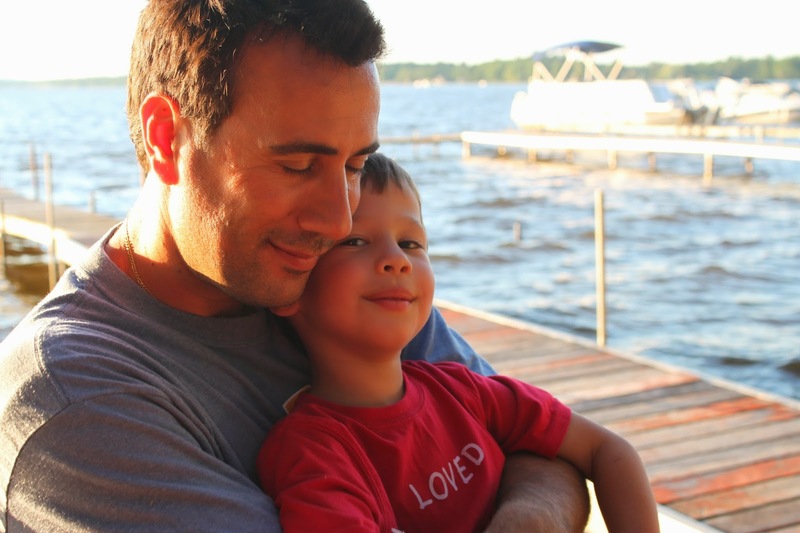 Yes, my boys love to dress themselves in mismatched pajamas! That is yarn from Dollar Tree, you can tell it's from the dollar store as I can tug hard on it and it breaks. I wouldn't recommend using this for any knitting projects, but it's great for this. We also had the perfect spot at our old house, I didn't even need to use tape. We have since tried this at our new house and don't have the catwalk for it so we used a hallway which required tape on the wall. Shh, don't tell my husband. I used clear packing tape and it didn't leave any residue on the wall or take off any paint but of course it will come down if you pull or tug on it too much. 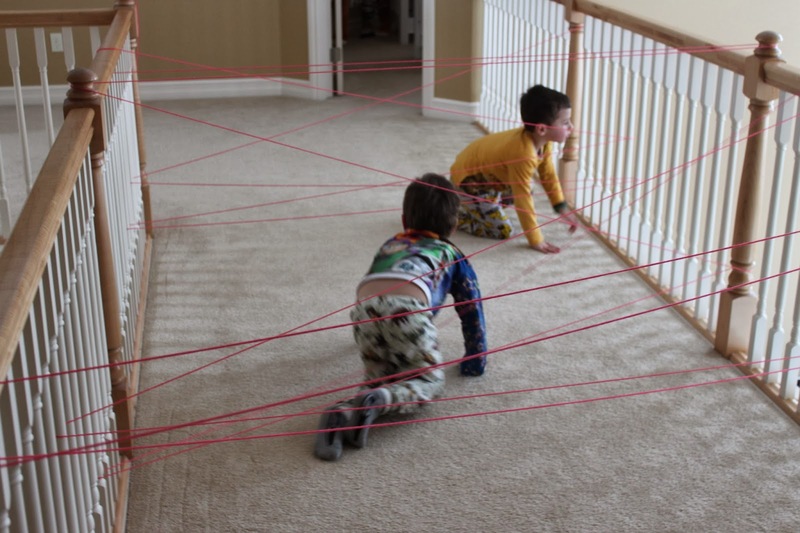 So instead of jumping and diving through the string like we used to do, it has now become a game of "try not to touch the laser beams!" This came from my childhood and was a favorite with my sister and our wonderful neighbor friend. I have no idea how we started this, but one person is blindfolded and simply has to taste a small amount of various "foods" and try to guess what they are. And of course, we always threw in a sampling of cayenne pepper or something similar and laughed hysterically about it. I have not done that to my boys, yet! We pretty much stick to the basics but I do throw in avocado or another vegetable, along with a piece of candy. Sometimes we plan to make something specific, but many times, I hand my boys the plastic containers filled with various art supplies and let them create whatever they want. 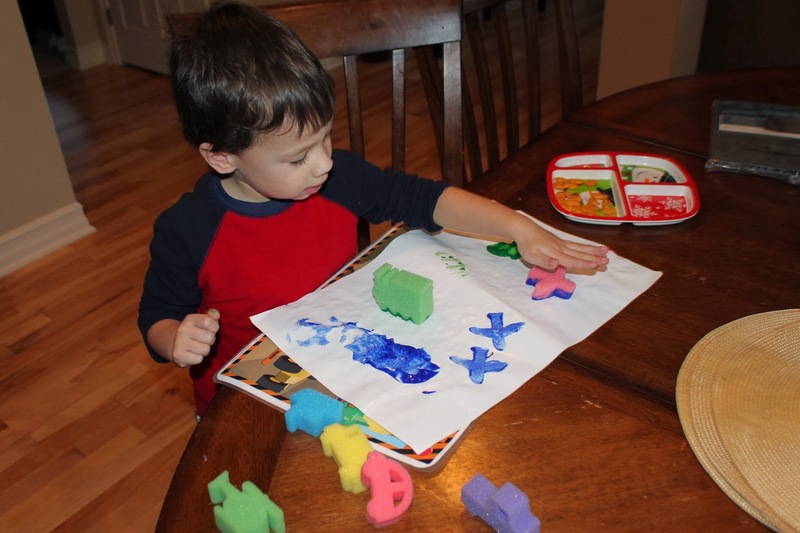 Glue, markers, "wiggly eyes," pom poms, glitter, pipe cleaners, and vehicle shaped sponges for stamping have all been good finds at Dollar Tree. Crayons, construction paper, and paint I usually pick up elsewhere. One year I saw these little, puffy handmade hearts on Martha Stewart's website and wanted to make my own with the help of the boys. I got red, white, and pink material from the fabric store along with white and red fabric paints and cotton stuffing. I cut the hearts out of the fabric and let the boys decorate them with the fabric paint, glitter, and sequins. 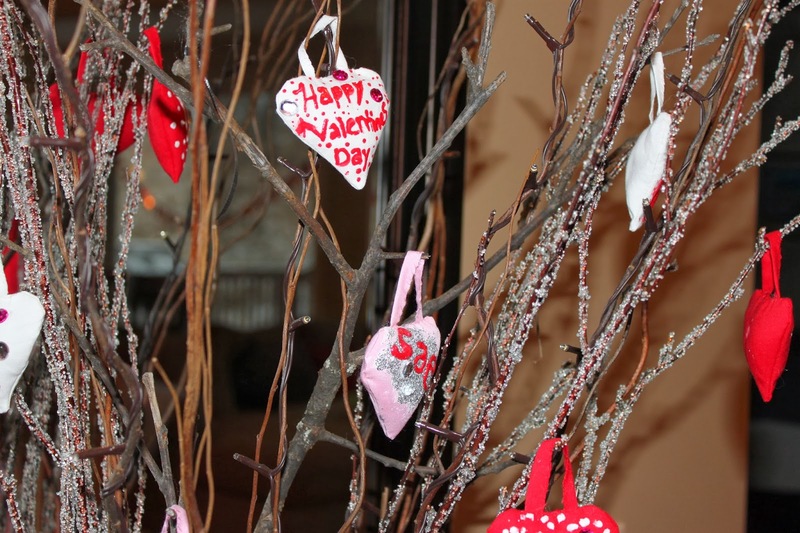 Once they dried, I sewed a decorated heart onto another undecorated one, stuffed it, and sewed it up with a small loop to hang on the branched floral arrangement I put up during the winter months. My sewing skills are beginner to say the least, but this project was completely manageable. The boys loved the hearts and patiently made several of them. 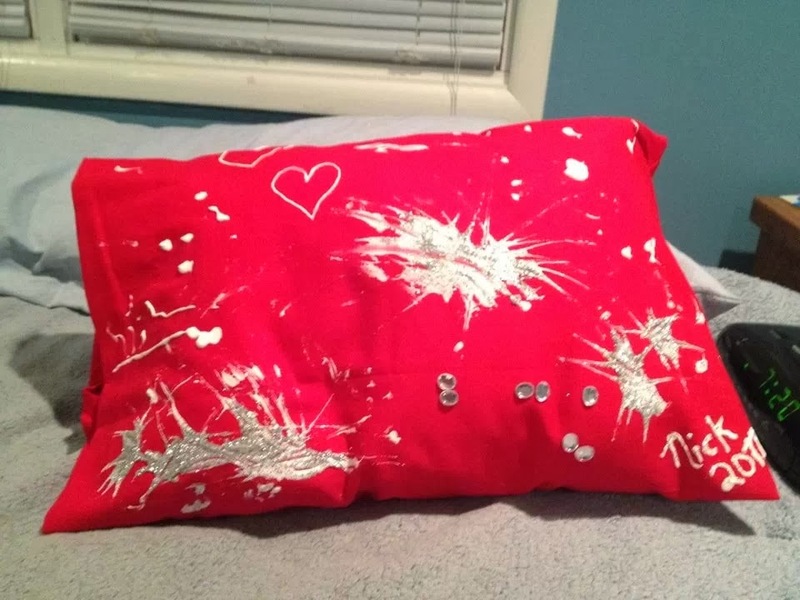 Since we had fabric left over and the boys had so much fun with this, I decided to make two small pillowcases for the boys to decorate and give to each aunt for Valentine's Day. 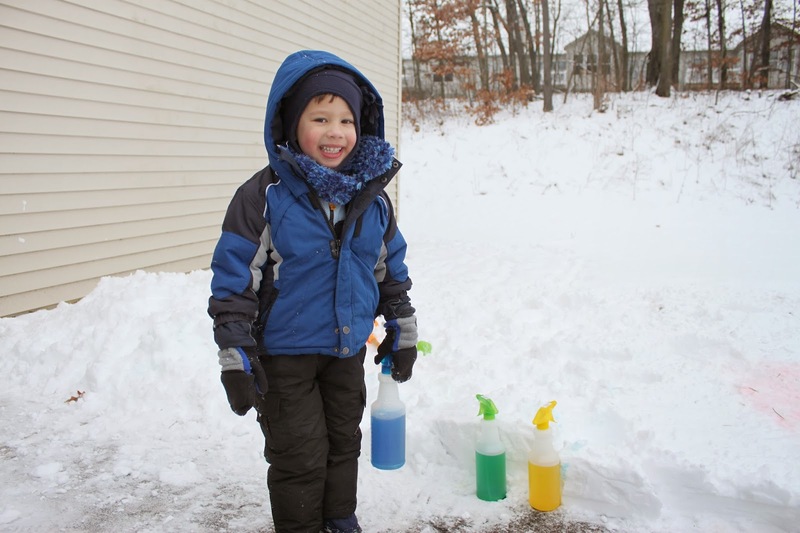 If the temperature is not freezing and bearable, we love to get out of the house and burn some energy sledding, making a snowman, painting snow (food coloring and water in a spray bottle from Dollar Tree), or making a snow fort. 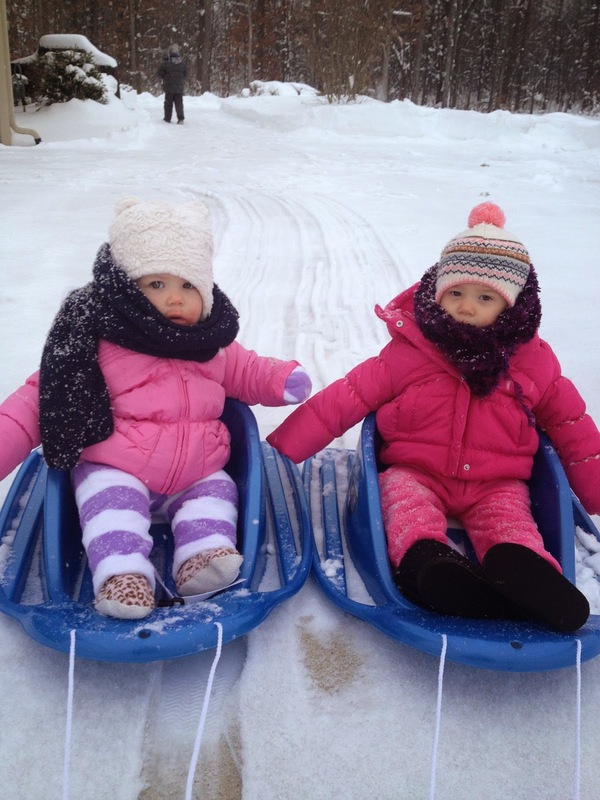 My 1 year old girls have loved going outside this year and being pulled in their sleds too! A small "bunny" hill in the backyard works for us! This year we made ice blocks, water and food coloring frozen in various plastic containers and cups. Since it has been so cold, we set the tubs of water and food coloring outside and they froze in a couple hours. You could also freeze these in your freezer if needed. Once frozen, I ran a little bit of hot water on the outside of the tubs and they popped right out. The ones frozen in the plastic containers popped out much easier than the ones in plastic cups. 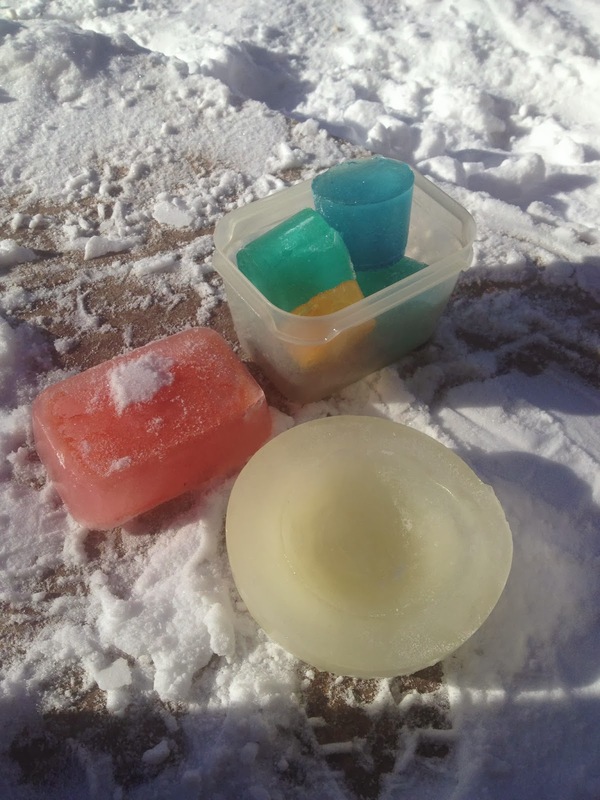 The kids played with these for a few days before they melted due to the warmer temperatures. Their favorite activity was burying these in the snow and then "digging for buried treasure!" While I don't recommend taking your kids outside when the temperature is this cold, we did find a couple fun things to do. 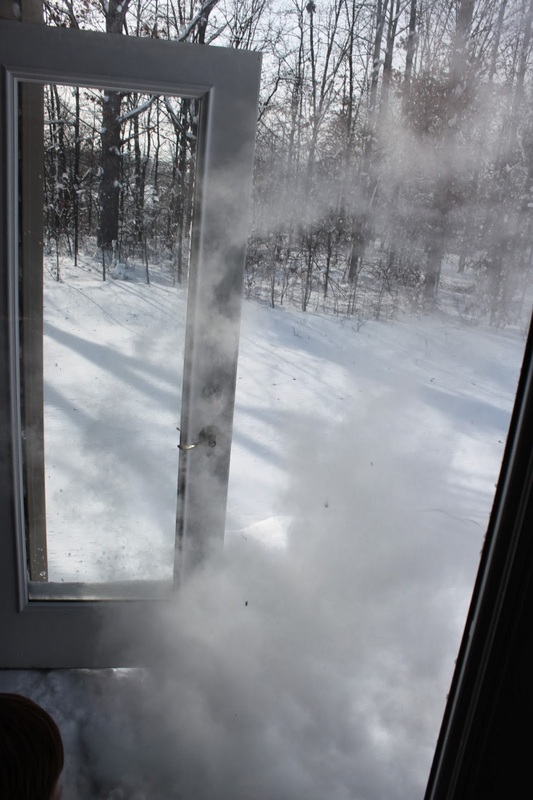 At zero degrees or below you can take boiling water and throw it into the air and it quickly freezes into tiny ice crystals and looks like a cloud. We had so much fun with this, we did it a few times. But, PLEASE be careful and use caution if trying this. The other below zero activity we tried was blowing bubbles. While our bubbles hardened into a stretchy film, they didn't completely freeze before popping. 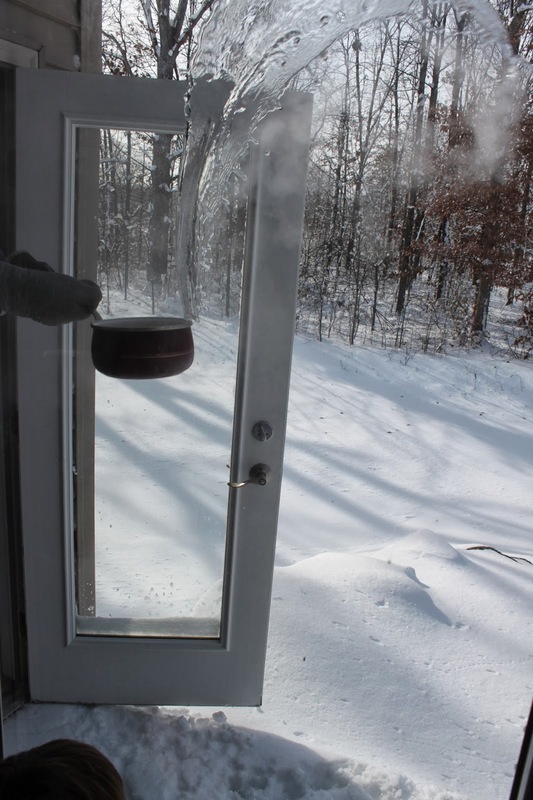 I didn't use a homemade bubble solution as recommended, but if we have another day of freezing temperatures I will try this again. You can see another mom's frozen bubble pictures here. They have to take them anyway, so why not make them fun? 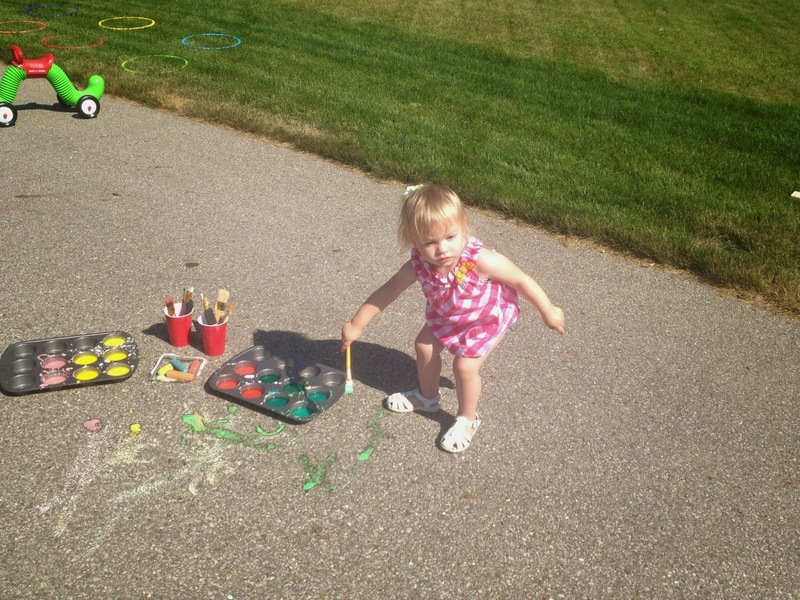 Aside from bubbles and toys, our two favorites are shaving cream paint and glow sticks. 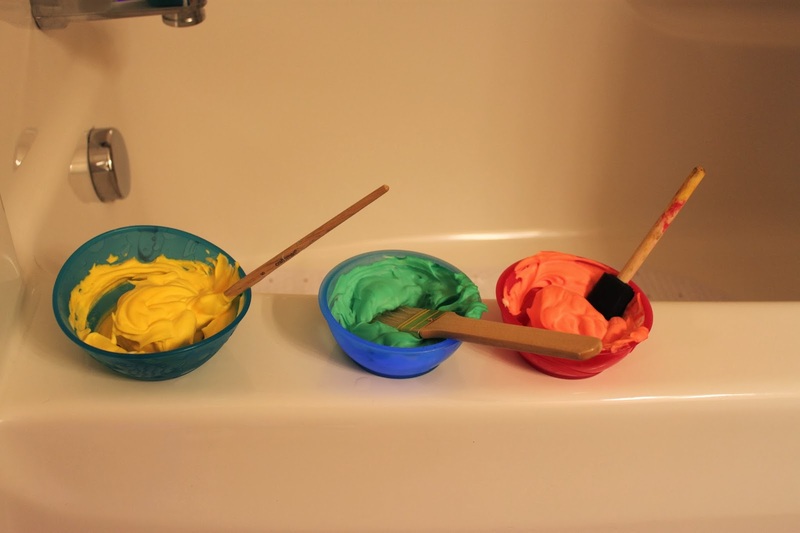 Use small plastic bowls, fill with dollar store shaving cream, add a couple drops of food coloring, mix and paint the tub with paint brushes! It washes right off and doesn't leave stains, plus the shaving cream doesn't smell bad either. At night, we like to turn off the lights and toss in a bunch of glow sticks (yes, Dollar Tree sells these). 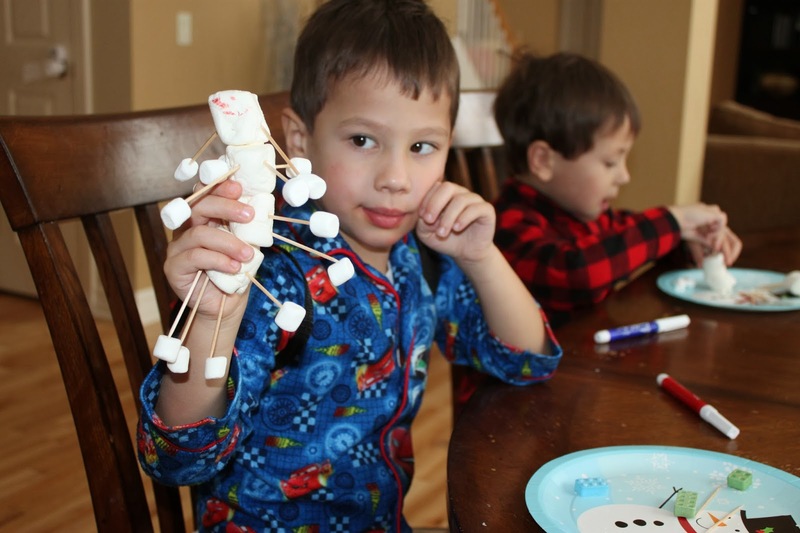 When it's too cold to go outside, we build our own snowmen inside with marshmallows, toothpicks, and edible markers. The larger marshmallows are perfect for this, but really you could use whatever you have and let them get creative. I found the edible markers at JoAnn Fabrics. Once the girls are in bed, the four of us head downstairs, turn off this lights, grab our flashlights, and have a blast playing in the dark and scaring each other. These are a huge hit here and we do a couple every month. Most of them require basic ingredients that you probably already have like baking soda, water, and dish soap. 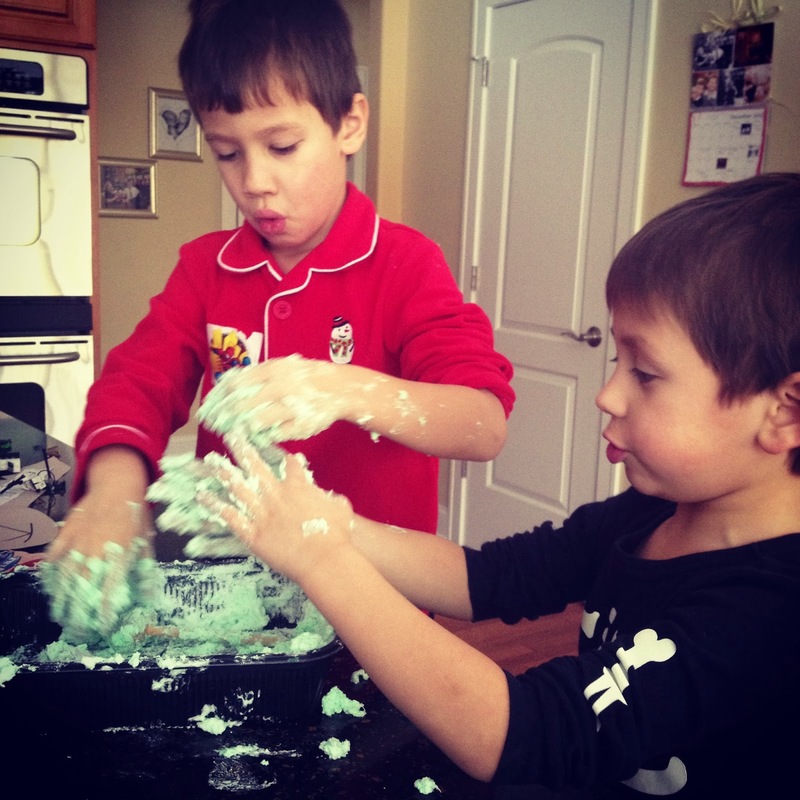 These are our two favorite recipes that we make often wizard's brew and oobleck.